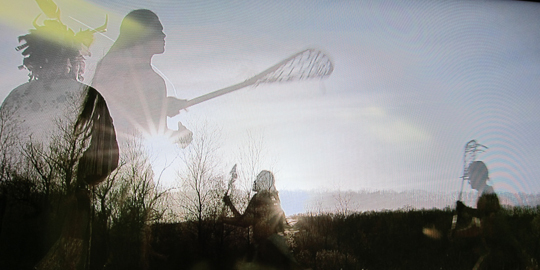 A documentary that focuses on the cultural and spiritual significance of the sport of lacrosse to the people of the Onondaga Nation is now up for an Emmy award. Stu Lisson, SU’s director for Electronic Media Communications at Syracuse University and the documentary’s executive producer, and Neal Powless, assistant director for Native Student Programs in the Office of Academic Affairs, were instrumental in the development and production of the documentary, entitled “The Game of Life, Heart and Spirit of the Onondaga.” The documentary was first broadcast last August on WCNY-TV. “It was a great experience for our EMC production team to work with the Onondaga Nation to help tell the story of their traditional game, which they originated, and also the University’s Haudenousaunee Promise program,” says Lisson. Lacrosse, known by the Onondagas as the “Creator’s Game,” has its origins deep within the customs and beliefs of the Six Nations people. The program features interviews with players, tribal leaders and coaches to tell the story of a sport that has grown to span the world. The Onondaga Nation’s involvement with the feature film “Crooked Arrows” is featured, as well as its connection with Syracuse University through the Haudenosaunee Promise program. The Haudenosaunee Promise is a unique opportunity that offers scholarships, which covers full tuition and mandatory fees, housing, and meals to Six Nations students to attend Syracuse University. The Emmy award nomination is in the category of Historical or Cultural Feature Program. The winners will be announced on April 14 at The Marriott Marquis in New York City’s Times Square. The documentary is also a special feature on the 20th Century Fox DVD of “Crooked Arrows” and includes scenes of the movie’s world premiere in Syracuse.